One of the many things I love about living in San Francisco is the topography, and how houses are built to accommodate it. A house that can seem totally unimposing from the front – a single-story home on top of a semi-subterranean garage – can actually turn out to be vast, with the street side actually being the top of three stories or more because of the downslope towards the back of the property. That was the case with this past weekend’s job. This was a deck-planting design for designer Patrick Lannan of Flora Grubb Gardens. It was fairly straightforward as far as planting goes, with only one fairly major challenge. The understated front of the house, a classic postwar “urban suburban” façade, belies its open-plan interior. The entire top floor had been opened up into one vast room with multiple couch groupings, and a kitchen and dining area. Out the back of the floor, an extensive deck with low glass walls perched high over the southern lip of Noe Valley, with unobstructed views across to Goat Hill and out to Bernal Hill and the bay. In front of the house was already a square planter with a dead tree in it. 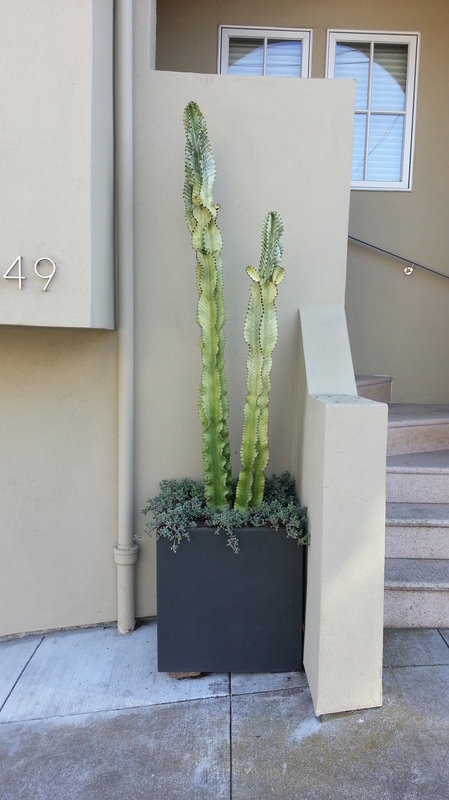 We planted a tall cactus-like succulent plant, Euphorbia ammak var. variegata, under-planted with a favorite groundcover of mine, Oscularia deltoides (syn. Lampranthus deltoides, commonly called Pink Vygie in its native South Africa). I love its little “dinosaur jaw” leaf structure, and its prolific pink daisy-type flowers all spring and summer. It will cascade over the edge of the container to the ground, almost covering it completely. The variegated Euphorbia ammak out front, with its soon-to-cascade pink vygie. Patrick and the homeowners didn’t want to impede any of the views, so everything chosen was for low height. The containers, again returning to the clean lines and look of Fibreclay, go nicely with the modernness of the geometry of the deck itself. The slate grey of the containers serves to “disappear” once planted. The dark color allows the eye to focus on the plants instead of the containers. I spoke with the owners about that during planting. We talked about how using brightly colored pots would actually distract you from the views, even if they were low. The containers would become the foci, rather than just having gorgeous plants to frame the view. Nobody wanted that. And so it begins. A herd of plants to sort. After: Triangle deck with screen of Yucca elephantipes. 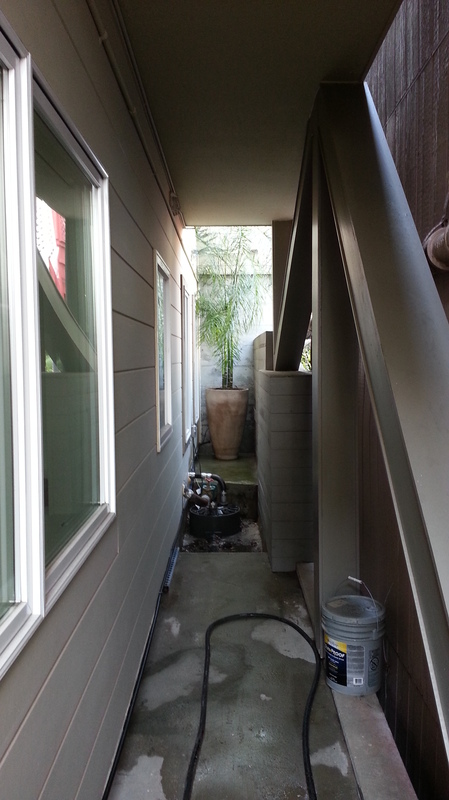 After: Side deck with Yucca rostrata and succulents. The gazing platform, flanked with troughs. I did a subtle variation between the two troughs. Two round compositions to anchor the end of the seating area. A little more closer-upper shot of the round comps. Overhead view of the rounds. Ask in the comments if you want to know specifics of any plants! The most challenging plant was a tall slender Maya Palm, Chamaedorea plumosa. This bamboo-like palm grows tall in a pot, with multiple trunks. The challenge was location: it (and its pot and soil bags) had to be schlepped through the house, down three floors, and out the the back yard. Then, it had to be carried back towards the front through a long, narrow corridor, where we potted it. We used a Sandhal pot, simply because it’s the tallest, skinniest pot at the store, and the purpose of putting the plant there was to both provide a better view from the bottom-floor gym, and to screen a window in the middle-floor bedroom. The remoteness of this plant, and its higher water needs, meant we had to run irrigation to it. The succulents upstairs need far less, and they can handle it with the hose on the deck. There’s the Maya palm, WAY down there. All-in-all, it was a very successful day of planting. The plants and pots were perfect, the compositions were phenomenal (natch) :), and the homeowners were thrilled with the now-completeness of their deck. The furniture had been sorta “floating” by itself out there, but now it was framed and anchored with plants, creating a complete room. Happy customers make for a happy Zann. This entry was posted in boZannical Portfolio, Gallery Posts, Gardening, Vertical Gardening and tagged botanical, flora grubb gardens, fog, garden, gardening, horticultural, microclimate, plants, san francisco, shoutouts, succulents, trees, urban, vertical gardens, woolly pockets. Bookmark the permalink. Beautiful work. Might the bluish yuccas be rostrata rather than whipplei?